Craig opened his door and stepped out to inspect the ditch where they’d come to rest, certain that, wherever they were, it was miles from the nearest beach, miles from the salt-rimmed sea, and miles from the sun-kissed torsos he’d been promised by the brochure. When he saw the boots — dozens of pairs straining to contain swelling feet, toes pointed to the turquoise sky — he stopped cold. This is my first try at Lillie McFerrin’s Five Sentence Fiction prompt. 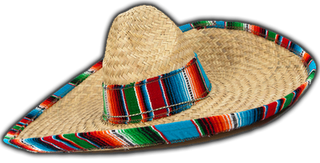 This week’s prompt: SOMBRERO. Check out the other responses on her blog! Constructive criticism, destructive praise, and general commentary welcome below. Chilling! Not a word consistent with sombrero, but it was chilling! Oh my God! And WOW! This one really knocked me for a loop. How timely, too. Good job. Thanks for reading! I was already trying to think of how to write a story about this when I suddenly remembered the prompt. Thanks Michelle, I really appreciate that! I really enjoyed yours too, with such a great build up to that ending. Really fine, succinct and chilling story telling! Thanks! It’s great to get feedback on this short stuff — not usually what I write. That was a finely crafted piece of FSF! It started out fun and light and got very serious very quickly. Nice turn at the end. I really enjoyed it! Really good to hear this one received well — thanks so much! This was my first one, but I’m already ready for next week. FSF = Addicting. I got hooked 5 weeks ago and can’t get enough. Uh oh. Not what you want to encounter! I need to read more please. . . . I feel these two are in serious danger now. . Loved it!